Nothing says summer like this simple dessert with plump heart shaped berries with a decadent helping of cream. I found these sun-ripened red goodnesses at grocery store and they turned out to be locally grown at a farm not far from where I live. I do not know what kind of strawberries these were and with all the different hybrids on the market these days I have lost track of what kind is supposedly the best. Theseberries though brought back memories of carefree childhood and sunshine, picking strawberries out on a field and popping one or more in your mouth even though you were not suposed to. 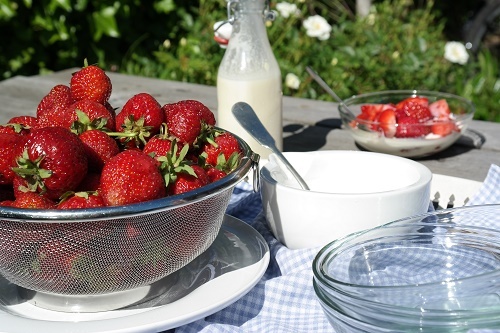 I do not know if you can do that anymore, pick strawberries for your own use. The berries were red, sweet and succulent. 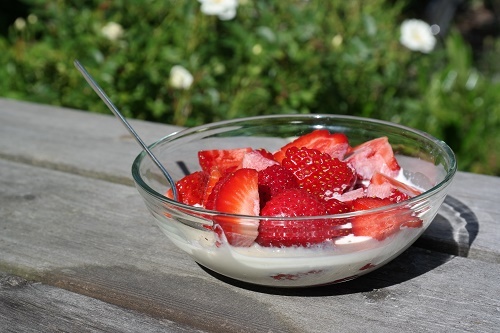 The taste reminded me of the oldfashioned strawberries that you still can get a few places, the kind that does not fare well with water because a few droplet make them spoil. Easy recipe for this dessert. 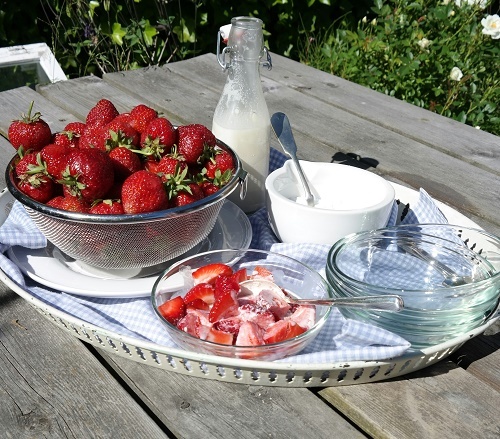 If the strawberries go get is not sweet, you can sprinkle sugar / powdered sugaron them. Enjoy them with friends and family to make new memories.